Bread sauce is a warm or cold sauce thickened with bread. It is a savoury sauce served with a main meal. 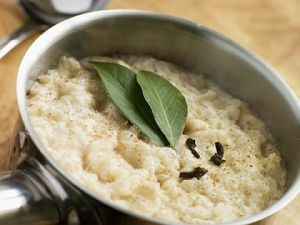 The sole survivor of the medieval bread-thickened sauces, the traditional British bread sauce is made with milk, butter or cream, and bread crumbs, flavoured with onion, salt, cloves, mace, pepper and bay leaf, with the fat from roasting often added too. It typically accompanies domestic fowl such as turkey or chicken. The use of slightly stale bread is optimal, making it an economical way of using up leftover bread. The sauce is easy to make and uses readily available ingredients. Turkish cuisine also features a cold sauce made from breadcrumbs mixed with pounded walnuts or hazelnuts and served with chick pea salads and, most famously, with chicken or duck as Circassian chicken.